This Assyrian stone relief from the northwestern palace at Nimrud shows two nearly assimetrical carved figures of King Ashurnasirpal II facing a stylized sacred tree and flanked by protective deities. The king is in his role as high priest and he is lifting his hand in worship towards a winged disk where the god Ashur resides. Ashur is the supreme national god of Assyria (Ashur). 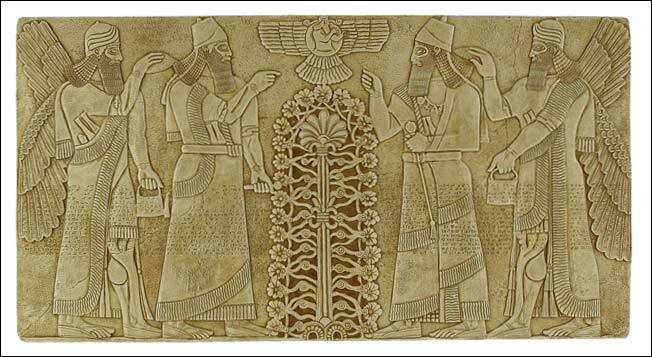 The sacred tree is related to the palmette symbol and represents the fertility of the Earth, especially the land of Ashur. The two protective deities are called �Apkalle�. They have the horned cap of divinity and hold a cone in the raised hand (to provide magical protection) and a bucket in the left.